Skerry's blog is so popular that it has garnered paid parternships. Bruck thinks of her blog like a class, and updates it frequently. Kaner aspires to make a career from her blog. Lifestyle blogging is more than just putting your life on the internet for fun. It is now a real platform for people to express themselves and their opinions. Beginning in the early 2000s, the trend has steadily risen. Now, bloggers can even make a living off of their work, with some earning millions of dollars. Even though they’re not making six figures, many Emerson students have started blogs of their own. A year later, she started a lifestyle blog. Naturally, she called it The Clunkster. Her website displays her makeup and outfits of the day through pictures taken in her dorm. Her mission is to make fashion fun by composing simple yet original outfits without worrying about what’s “in” and what’s “out.” Posts like “Trashcan Day” or “I’m Running Out of Outfit Titles” reflect her humorous personality, and her desire to differ from too serious lifestyle bloggers. “I believe that fashion should be fun and I want my readers to have fun too,” she says on the website. Bruck, a sophomore writing, literature and publishing major, said she stays on top of her site by treating it as another class. Her blogging experience has made her want to work for a fashion magazine, or even to start her own. Even though she said it’s a decent time commitment—she spends around three hours weekly on it— Bruck wants to put even more emphasis on her blog. She now has over 300 followers on her Instagram, and gets 300 page views a month on her website. Courtney Kaner, a junior journalism major and lifestyle blogger of more than three years, believes a lot of people want to follow the blogging trend for the free advantages and partnerships. “It’s very appealing to people,” she said. “People try to alter their own lifestyle to fit the trend. But for Kaner, passion is what you really need to start a website. Her minimalist blog, Navy and Lace, follows the seasons and focuses on lifestyle, home décor, health, and food, and she is looking to expand it. She even hopes to turn it into a career. Kaner also has a YouTube channel where she posts beauty and fashion tutorials. Her last post was about her first ski trip to Jackson, NH, and was accompanied by a series of white snowy pictures of her trip. Her blog consists of over 20 pages of carefully curated material. Kaner also works for the campus magazine em Mag, but she prefers the advantage of blogging because of the freedom it gives her to to write on topics she really cares about. Her favorite part is coming up with new ideas. “That’s when I get the most excited, it’s when I think about content,” she said. She tries to post at least once a week, and takes advantage of school breaks to post more and create content in advance. Kaner said that coordinating her blog schedule with her transition to college wasn’t easy. Now living off campus, consistent posting has become easier. “[Lifestyle blogging] is just like taking the things you love in your own life, in your own lifestyle and showing everyone else that you can do this too,” she said. Bitsy Skerry, a junior marketing communication major, was always interested in fashion and lifestyle bloggers. In her junior year of high school, she decided to follow the trend and to start documenting her personal style. “I think of every day as an opportunity of getting dressed to express yourself and who you are,” she said. Her minimalist black and white blog, Bits of Style, is a personal style website where she shares not only her ‘70s and ‘90s inspired outfits of the day (OOTD), but also beauty advice and political opinion articles. She names, explains, and describes every look she wears. 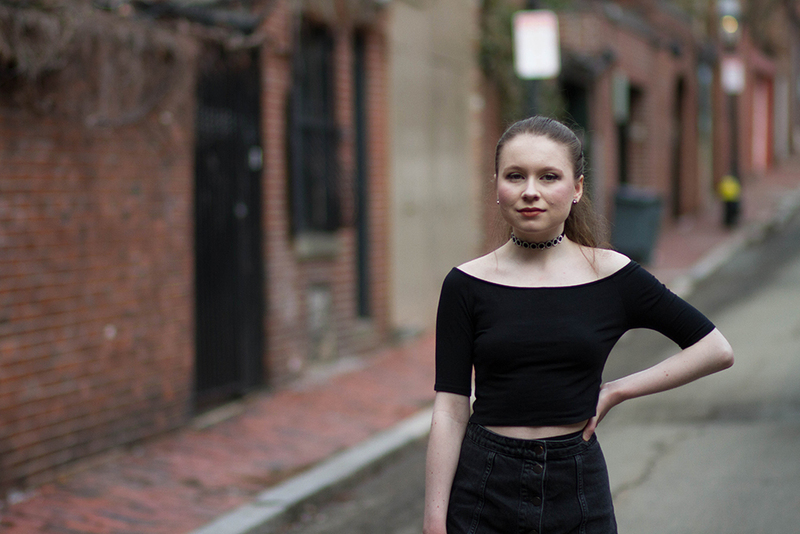 Her last OOTD post was a series of snapshots of her self-described “angsty” monochromatic black look around Boston. Skerry said it takes a lot of time to get results and opportunities in the blogging community. It was only after three years that Skerry got paid partnerships with brands such as Primark. “It’s so fun, but it doesn’t happen overnight,” she said. Skerry also sees Bits of Style as an interaction with her readers and a meaningful way to express herself and inspire those who follow her. Her site serves as more than just a platform to give fashion advice—she uses it to express her opinion and let her voice out. “I feel being a lifestyle blogger is sharing your life with others and with the goal of inspiring others in the process,” she said. Skerry also said Bits of Style helped her obtain valuable skills that she can apply in her career and beyond. She strengthened her communication skills and learned how to market herself, how to code, and how to design a website. Skerry now posts at least once a week, trying to stay as consistent as possible while juggling it with her school schedule. Bits of Style now has over 1,000 readers, and between her photo shoots, the writing, and the promotion, she spends around eight hours a week on the blog. “[Lifestyle blogging] is something exciting to be a part of,” she said.